If you're from Rhode Island, or the nearby area, then you're probably familiar with the readily available fresh, local pizza dough...Calvitos, Crugnales, DePetrillo's, DeFuscos (just to name a few). Each bakery has their own secret recipe portioned out in 1 pound bags; you take it home, let it rise on the counter for 30-45 minutes, and your good to go. One might say I am dough obsessed...as I mentioned in my last post, my family owned a Deli in Cranston, RI throughout the late 70's and the 80's. Louie's Deli, formerly Vinny's Bakery....I know, right?...totally not mafia related, but straight up old school Italian. Crugnales Bakery was our dough supplier, they delivered 2-3 times a week. This is the dough that was used to make RI pizza strips, spinach pies and coneschones (deli meat and cheese filled calzone). I will be doing a separate post on all of these later (~teaser~). Back to the dough...it was a yeasty and sticky...trying to peel it out of the bag took a little effort; it was filled with tiny air pockets (from all that yeast fermenting) and was easy to roll/shape-as long as you didn't over flour it. You had to prick it a thousand time with a fork to avoid those unsightly pizza bubbles that can form when baking. When it was baked, it formed a crunchy crust with a terrific crumb (the inside of the crust). I never started making my own pizza dough until I moved away; it took me a long time to try and replicate the Rhode Island dough I loved so much...but think I have finally cracked the code! This dough is yeasty and filled with tons of air pockets; it's very forgiving...I don't even use a rolling pin, I just press it out into the pan. If you do happen to tear it, just pinch it back together. 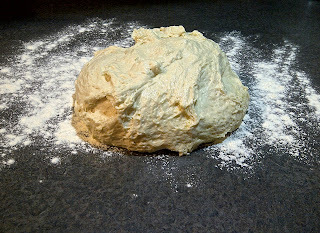 This dough can be made with or without a stand mixer; I've made by hand many, many times. 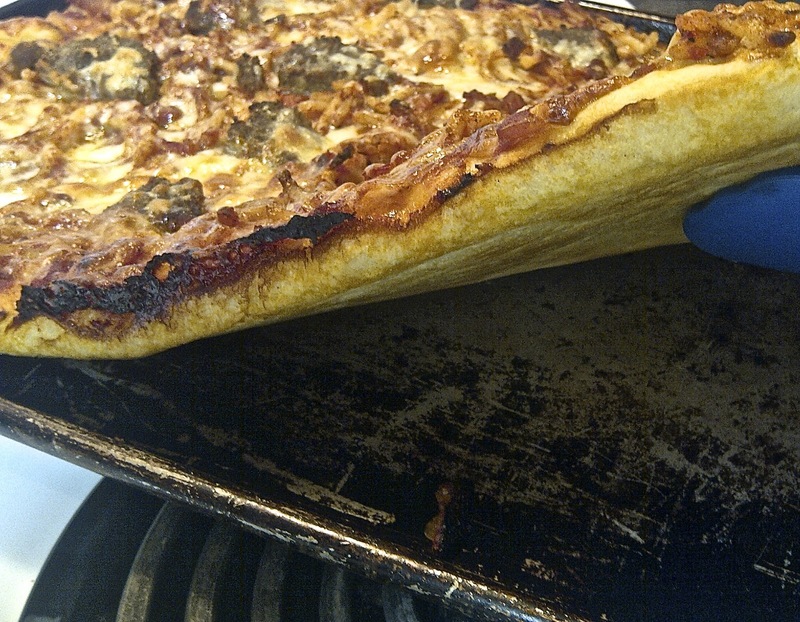 A well seasoned pizza pan is also helpful. As you can see in my photos, my pizza pan is well aged. I do have a few shiny new pans, but they just don't create the same golden, crispy crust...if you don't have a seasoned pan just slide the pizza directly onto the oven rack for the last few minutes to crisp up the bottom. Bread flour is recommended, the dough will rise better and have a chewier crust. Some planning ahead is required; this takes about 2 hours to rise. 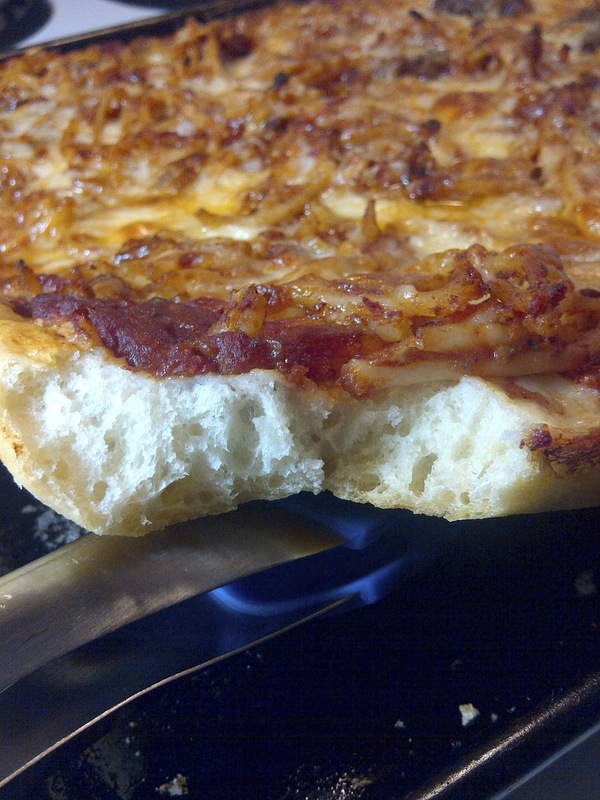 This recipe will yield 1 -18"x13" thick crust, or 2 -18'x13" thin crust pizzas. I went with a thick crust this time, topped it with lots of leftover sauce, bucatini & cheese. In the mixing bowl for your stand mixer add 1/2 cup of lukewarm water (100-110 degrees). Sprinkle in the yeast, sugar, and salt; stir to dissolve and let bloom for 10 minutes. The yeast should now be bubbly, frothy, and fragrant. Add in the flour and the remaining 1 cup of lukewarm water. On the lowest speed, mix with a dough hook attachment for about a minute then scrape down the sides and bottom to ensure all the flour is incorporated. Continue to knead the dough for about 7-8 minutes. This is a sticky dough, but it should hold together, pull away from the sides of the bowl, and have a firm, smooth appearance. If the dough is too sticky, add additional flour 1 Tbs at a time, until the dough starts pulling away from the sides as instructed. If mixing by hand, it usually takes about 15 minutes of kneading to achieve these same results. Pour the olive oil down the sides of the mixing bowl, turn the dough to coat it in the oil. Cover tightly with plastic wrap then drape a dishtowel over the bowl. Let rise in a warm area for 2 hours. 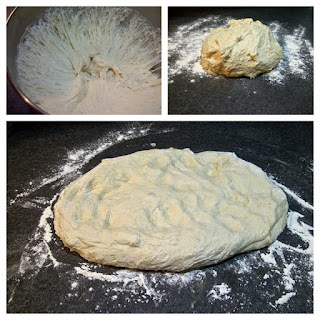 Uncover and punch down dough, let rest 5 minutes. Meanwhile, preheat oven to 450 degrees, grease a baking sheet(s) with olive oil, flour work surface. Turn dough onto floured surface, divide in half if making 2 thin crust pizzas. Lightly flour the surface of the dough and press into desired shape, adding additional flour to the underside as needed to prevent sticking. If making thin crusts, a floured rolling pin may be needed to roll and shape the dough. Place dough in prepared pizza pan, pressing to the edges, and work out any uneven spots. Prick all over with a fork. Add desired sauce and toppings, bake for 20-25 minutes rotating the pan halfway through. I don't mind a bubble in the crust, but not in the center of the pizza, I'm wired like that. Rhode Island always makes me think of Pauly D (of Jersey Shore fame... embarrassing). That guy is REALLY into being from Rhode Island. And man, that doughy goodness looks incredible! Believe it or not, I have never watched that show. I'm probably the only RI-lander that hasn't. I'm more of a Family Guy fan. Rhode Island makes me think of coffee milk (the official state beverage). Mmmmmm. Anyway, one secret to awesome and flavorful dough is to let the yeast work its magic longer. I like to mix it the day before we need it and let it rest in the fridge. All those yeasty flavors really give depth to the flavor of the crust. Failing a long rest, I substitute beer for water in the recipe and get much the same flavor. I am a Rhode Island native living in Maryland and was excited to find your blog. I look forward to making pizza with your RI dough recipe and wondered when you might do the follow-up on spinach pies. There are one of my favorite childhood foods and I have not been able to find them anywhere in the MD/VA/DC area. Yes, they are hard to find outside of RI. Of course this opens the debate of canned vs frozen spinach....a heated topic in our house. I am still on the hunt for RI spinach pies in Maryland, a place in RI that ships to MD or the best option, a good recipe for spinach pies that I can make at home. My sister in RI and are have a disagreement regarding the spinach pies and calzones. She says it is the same preparation an dough for both pies and calzones. I remember spinach pies as being distinctly differ in terms of texture, etc. of crust. I figured, you would have the best handle on the calzone v spinach pie preparation debate. I hear you on the spinach issue. As a child, I probably ate pies with canned spinach (we got them from Jeanette's among others). Now I would definitely used frozen or fresh. I also don't remember cheese in the spinach pies we purchased in the 1960s, 70s, but my web search indicates that a lot of places now include cheese. Am I remembering regarding no cheese or did they always include it? I use the same dough for both pizza and spinach pies...give your spinach pies a good slathering of your favorite cooking oil, and bake them at 425-475 to crisp and char the crust, if you can bake them on a pizza stone, even better. Our favorite pizza place on Federal Hill, Caserta's, uses CANNED spinach (I saw large 6/10 food service-sized cans of spinach in the back room). They are available plain, with cheese, with pepperoni, or with both. I'm not sure when the cheese came into the picture, I remember eating them plain as well. 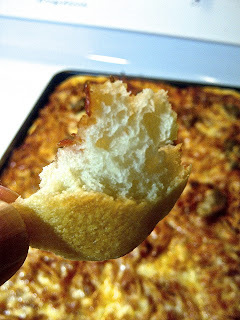 Try theoriginalitalianbakery(dot)com..they ship pizza chips. That's the only place I can think of. I am actually in RI for a while, I'll keep my eyes open. Can I make this dough the night before? Do I refrigerate it if I do? Hi Shanti. Yes you can make this ahead....follow directions as listed above, but instead of rising on the counter for 2 hrs you can pop it in the fridge overnight. The dough will rise, just much slower when in the fridge. Plan on taking the dough out of the fridge to rest at room temperature for about 30 minutes when ready to roll out. Hope this helps!